Heat gas or charcoal grill for indirect grilling as directed in owner's manual. Cut 4 (18x18-inch) sheets of heavy-duty foil; spray foil with cooking spray. Insert fork or tip of table knife into edge of each ramen noodle pad from soup mix to break into 2 thinner pads. 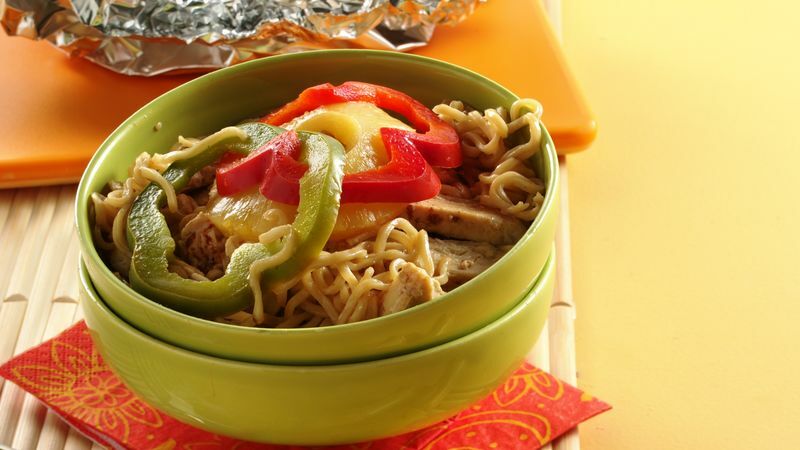 Place 1 thin pad of noodles on each sheet of foil; break off tips of noodles to avoid puncturing foil pouches. Top evenly with chicken, pineapple and bell pepper. For each pouch, bring all edges of foil up, leaving opening in top. In 2-cup measuring cup, mix contents of seasoning packet from 1 package of soup mix (reserve second packet for another use or discard), the reserved juice from pineapple, soy sauce and enough water to make 2 cups. Carefully pour about 1/2 cup mixture into each pouch. Bring all edges of foil together at top; pinch to seal tightly. Place pouches over unheated area on grill; cover grill. Cook with medium heat 20 to 25 minutes, rearranging pouches after 10 minutes, until chicken is thoroughly heated. To serve, carefully loosen edges of pouches to allow steam to escape. Pour into individual soup bowls. We discovered that 3-burner gas grills cook very evenly so packets do not need to be rearranged. Two burner gas grills require rearranging of the packets. Opening the cover releases heat so the cook time may have to be lengthened.